Our time in Israel is rapidly coming to a close. The first week of the journey seems to go so slowly and the second week just races by. Thursday was a serious day. After breakfast at the hotel we went to Yad VaShem, Israel's Holocaust memorial and research center. About half the students, particularly those who had never been before went through the museum. The other half visited a number of the exhibits on the grounds of Yad VaShem, the Valley of the Communities, the Partisans memorial, the forest of the Righteous Among the Nations and the Children's memorial. Our guiding question was what do we want to remember about the Holocaust and why. After Yad VaShem we walked to Har Herzl, Israel's national cemetery. As we visited graves on the grounds we discussed the sacrifices that many young men and women have made through their military service to support and defend the State of Israel. After, such a long and serious day, we wrapped up with a session where we processed our feeling through art, followed by a delicious dinner at a traditional Jerusalem restaurant and free time on Ben Yehuda Street. On Friday, we began to sum up our time in Israel with a program called, "Meet the Israelis." We spent about two hours with six different Israelis, one from the settlements, one ultra Orthodox, another a liberal Tel Avivian, another an Olah Hadasha, another doing their army service and yet another of Ethiopian heritage. 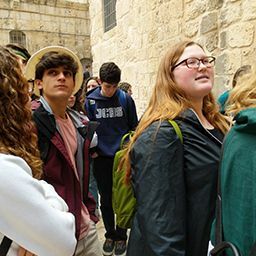 They each shared their experiences and outlooks of Israel with our students, rotating through small groups that gave everyone a chance to listen and ask questions. It was a small taste of the diversity of Israel and helped pull together the many experiences we have had over the past 12 days. In the afternoon we all went the Shuk, Mahane Yehuda, for some lunch, shopping and a chance to see Jerusalem prepare for Shabbat. Now we are winding down and getting ready for our final Shabbat in Israel. We will go together to the Kotel for Kabbalat Shabbat and then come back to the hotel for our last day. Also, please note. We just got a notice from United that our flight may be delayed from a 1 AM to a 5 AM departure, which means we will arrive at 9:40 AM rather than 6:00 AM. Please check the flight status for United #955. If it turns out we are leaving at 5 rather than 1 AM your students may be even more tired than usual, but still full of stories to tell you. Looking forward to seeing you on Sunday, at whatever time.